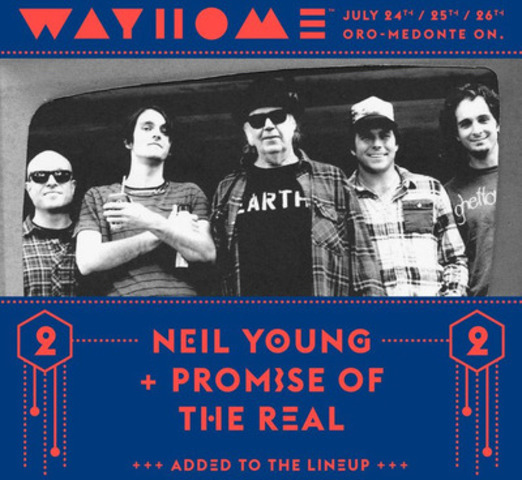 TORONTO, April 20, 2015 /CNW/ - Republic Live and AC Entertainment announced earlier today that legendary rock icon Neil Young and his band Promise of the Real will be headlining the inaugural WayHome Music and Arts festival taking place July 24th – 26th at Burl's Creek Event Grounds. 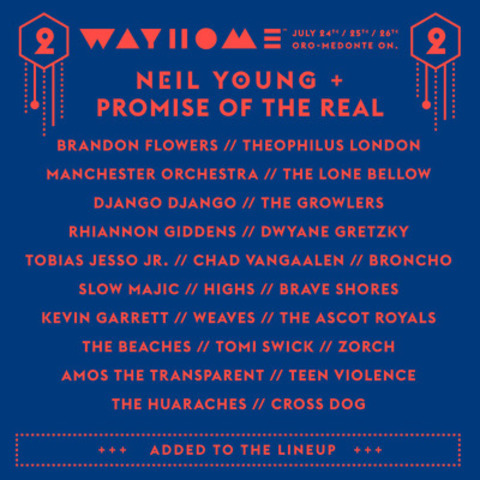 An additional 24 artists will also be joining WayHome's already remarkable first year line up, including Brandon Flowers, Theophilus London, Manchester Orchestra, The Lone Bellow, Django Django, The Growlers, Rhiannon Giddens, Dwyane Gretzky, Tobias Jesso Jr, Chad VanGaalen, Broncho, Slow Magic, Highs, Brave Shores, Kevin Garrett, Weaves, Ascot Royals, The Beaches, Tomi Swick, Zorch, Amos the Transparent, Teen Violence, The Huaraches and Cross Dog. "It's a true honor to welcome a legend like Neil Young to the WayHome Music and Arts Festival, " said Shannon McNevan, Executive Director, Republic Live. "Our goal with WayHome has been to offer a line up that is rich in its breadth and depth, presenting legendary iconic artists along with some of the most exciting new emerging performers as well. With headliners like Neil Young, Sam Smith, Kendrick Lamar, Alt-J, Modest Mouse, Hozier, along with more than another 60 musical acts, we know that fans will have an unforgettable experience at WayHome." "Today's announcement further establishes WayHome Music and Arts as a major player among North America's premiere music and arts festivals," said Ashley Capps, CEO of AC Entertainment. "Already the reaction to this first year festival has been extraordinary, with tickets selling in every province; throughout the United States, and internationally. And we're just getting started." Additional information will be announced in the coming weeks about the WayHome Music and Art Experience, including details about late night spectacles and experiences, original art installations, special international and local food offerings, an on site farmers market and much, much more.